I wanted to revisit these shamefully good cupcakes for a couple of reasons. One, when I took the original pictures the first time it was in a dark kitchen on my iPhone in the middle of a party and the pictures didn’t do the cupcakes justice. The second is that to this day that post is my most viewed post by far every single day and I figured going in to the holidays we all need an incredible dessert recipe. Some of you that are newer to the blog weren’t following this summer and never saw these, so let me explain: rich chocolate cupcakes filled with a homemade caramel, swirled with decadent peanut butter buttercream frosting, drizzled with caramel and topped with chocolate curls and honey roasted salted peanuts…. 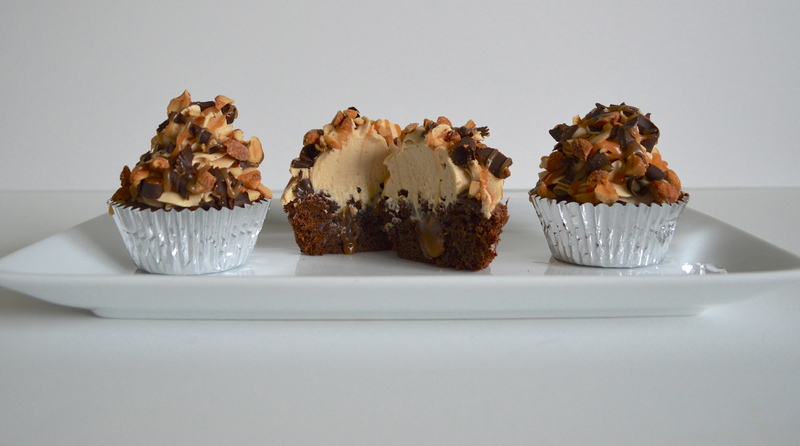 a snickers bar in the form of a cupcake! The recipe and step by step pictures can be found here in the original post and I hope you all get the chance to make these this holiday season! Also, the giveaway ended last night and the winner is…. GINGER G.! Email me (makingitwithdanielle@gmail.com) and I’ll set you up with all the details on how to get your prize! Thanks, they are every bit as delicious as they look!